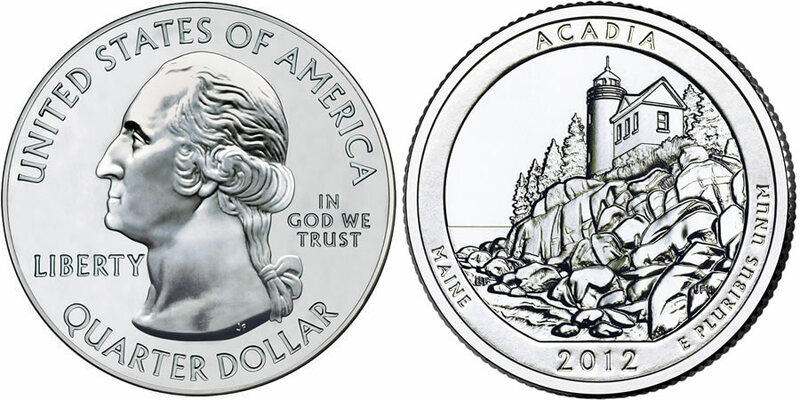 The 2012 Acadia Silver Uncirculated Coin will mark the third 2012-dated release of the US Mint's America the Beautiful Five Ounce Uncirculated Coin™ series. Shown on the reverse of the coin will be a design emblematic of Acadia National Park found in the state of Maine. Coins in this series each honor a different site of national interest from around the United States, the five US territories and the District of Columbia. The coins are struck as the numismatic versions of the Mint's America the Beautiful Bullion Coins and are composed of five ounces of .999 fine silver with a diameter of three inches like those bullion strikes. However, whereas the bullion coins are produced for investors and sold through the Mint's network of authorized purchasers, these uncirculated coins are struck for collectors and sold directly to the public by the US Mint. Acadia National Park was originally established as Lafayette National Park on July 8, 1916. It is composed of 47,390 acres covering much of Mount Desert Island and the associated smaller surrounding islands off of the Atlantic Coast of Maine. The inscriptions of UNITED STATES OF AMERICA, LIBERTY, IN GOD WE TRUST and QUARTER DOLLAR surround a portrait of George Washington, the first President of the United States on the obverse of the coin. This image of Washington by John Flanagan can be found on all of the America the Beautiful coins including these silver uncirculated coins, the silver bullion coins and a series of circulating quarter dollars known as the America the Beautiful Quarters®. 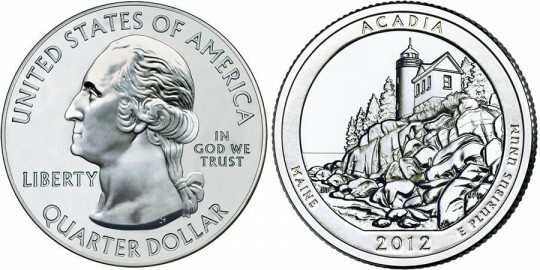 On the reverse of the coin, a design emblematic of Acadia National Park can be found. This design was completed by designed by AIP Associate Designer Barbara Fox and sculpted by United States Mint Sculptor-Engraver Joseph Menna to show Bass Harbor Head Lighthouse on the rough Atlantic coast of the park. Surrounding inscriptions include ACADIA, MAINE, 2012 and E PLURIBUS UNUM.